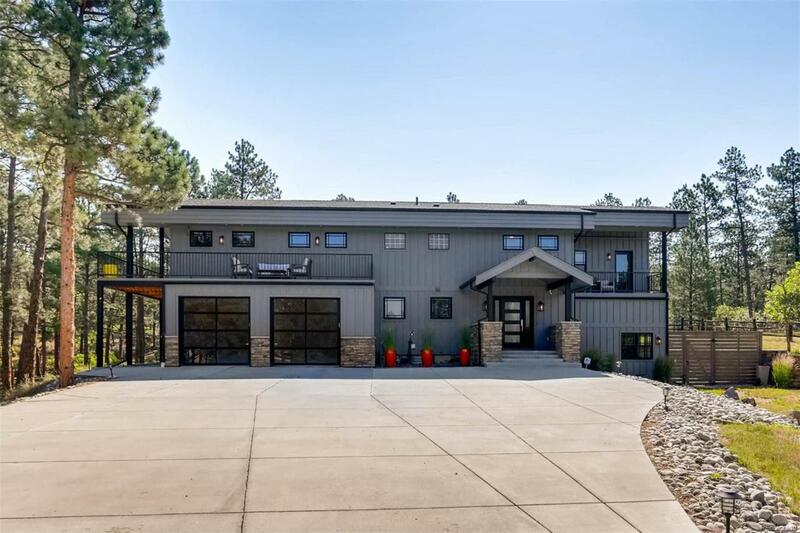 Rustic modern masterpiece, privately nestled amongst the pines, but only a 35 minute commute to DTC. The gourmet kitchen is the centerpiece of this newly updated home, complete with top of the line stainless steel appliances including a double oven, gas cooktop and warming drawer. Abundant light throughout helps showcase the living room with a wall mounted TV and French doors leading to a private patio with views of the property. Spacious dining room with a 2nd set of French doors leads to your backyard oasis. Designed with mans best friend in mind, this fenced backyard includes two separate patios for entertaining. The Master retreat includes a wall mounted TV, walk in closet, French doors leading to a deck with beautiful views and a 5 piece Master bath with soaking tub, double vanity and a rain head steam shower. Theres even 5 mini split AC units throughout the home. Completely fenced on just over 5 acres, this modern retreat offers the privacy and luxury youve been waiting for.